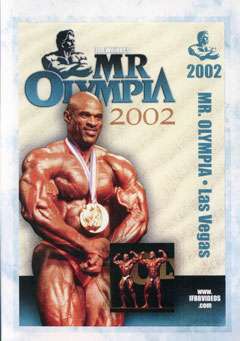 2002 MR. OLYMPIA. SEE MORE MUSCLE, SAME PRICE! All the dynamic, dramatic posing routines, all the action! Ronnie Coleman does it again. This the very last Mr Olympia appearance by two greats; Flex Wheeler and Nasser El Sonbaty. All the dynamic, dramatic posing routines, all the action! Ronnie Coleman does it again. This was the very last Mr Olympia appearance by the great Flex Wheeler.